ANY PARENT WITH YOUNG CHILDREN KNOWS ALL TOO WELL THAT SERIOUS MEDICAL ISSUES RARELY FIT NEATLY INTO A FAMILY’S BUSY SCHEDULE. ON THE CON TRARY, THEY OFTEN STRIKE AT THE MOST INOPPORTUNE TIMES. When accidents or sicknesses occur at night— such as a nasty cut requiring stitches or a persistent cough that makes it hard to sleep—parents usually find that their only course of action if their pediatrician’s office is closed is to drag the child to the emergency room. But the hours of waiting and intimidating setting of the hospital can lead to unsatisfying results. Company founders Steven Katz and Dr. Jeffrey Schor encountered similar situations with their own children and decided there was a better way to deliver acute pediatric care. PM Pediatrics was born in 2005 in New York and has since spread to five ot her states along the East Coast, including the newest location in Cherry Hill. Offices will also soon be opening in Pennsylvania, Texas and California. “We are thrilled to be in the Cherry Hill community and to show everybody what we’re about— the kid-friendly space, the efficiency at which we work and the scope of medicine that we provide,” says Dr. Christina Johns, Senior Medical Advisor for PM Pediatrics. The goal of PM Pediatrics is not to replace a child’s regular pediatrician; for example, they do not provide well visits or other services such as sports physicals or flu shots. Rather they endeavor to establish solid relationships with the pediatricians in the area and complement the care they offer. “We stay in our lane and provide specialized, acute pediatric care for ill and injured children,” Dr. Johns says. “Our expertise lies in taking care of kids with broken bones, kids who get cut and need stitches, kids who might be dehydrated and need an IV and kids with a sore throat or a rash.” The Cherry Hill location is open until midnight every day of the week, offering convenience and comfort for families. Unlike most traditional urgent cares or emergency rooms, the entire staff has expertise and experience specifically in pediatric acute care. In addition to the exceptional care they provide on a daily basis, PM Pediatrics is also committed to educating patients and families and ensuring they have the most up-to-date pediatric knowledge at their fingertips. Practical a nd useful information is available through their website, the PM Pediatrics app and social media. Dr. Johns is leading the way in this regard. She was a regular contributor on Good Morning America, and has made numerous TV appearances as a medical expert on several net works, including CNN and Discovery Health. She hosted a medical talk radio show for Clear Channel Radio and has written extensively about pediatric care for local and national publications. 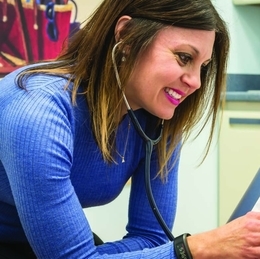 Her interesting and timely Dear Dr. Christina blog—covering a wide range of subjects, from bug bites to skin conditions—can be accessed by clicking the “Dear Dr. Christina” button on the PM Pediatrics website. She also posts frequently on Facebook (Dr. Christina Johns) and Instagram (DearDrChristina). At the end of the day, helping children feel better is the ultimate goal for PM Pediatrics, no matter how they deliver that out come.